Hide n See, a universal app with a built-in red filter that works similar to the classic red decoder glasses can be used for creating, sharing, and viewing secret messages. While the app is simple to use, whether creating or viewing messages, in-app help is available throughout. Hide n See is intended for kids aged 7+; however, younger kids will enjoy the app, too. Features such as the narration of the help screens will assist those that may need it in reading the instructions. The robot voice used for narration adds to the “techie” feel of the app. Type a short message, make it a colorgram, swipe horizontally and vertically to make it a mirrored image and to flip it upside down. Don’t forget to choose how bright the hidden text should be. Messages can be shared by sending them via e-mail, MMS, etc., or by printing them. If you do not have an air printer, e-mail the message to a computer that can print. Messages can then be sized and printed as desired (stickers, signs, etc.). For a kid-safe option, use the pretend to send option. 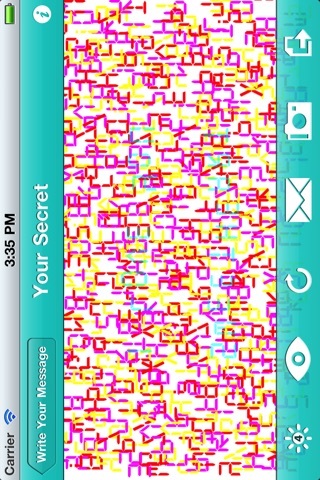 The swiping techniques and color bars are used in reading received secret messages. You are not limited to reading messages sent to you, but are able to read printed messages, messages on your computer screen, etc. Hide n See allows you to read the messages using your device camera. The possibilities for this app are endless. For fun ideas on how the app can be used for science projects, wedding invitations and more, go to http://hidesee.com. The ideas link currently goes to their Facebook page and you’ll have to dig through the posts. It would be ideal if the Ideas were organized on their web site. Hmm… Using Hide n See for a scavenger hunt would be a new twist to an old family favorite. The app takes on a fuzzy appearance when zoomed to utilize the larger size of the iPad screen. Not being able to utilize the full screen seems like a waste. Hide n See would seem so much more impressive if it were crisp and clear while in full screen. The app does not contain in-app purchases or ads; external links and social media buttons are on the settings menu. Remember the hidden messages on fun placemats and cereal boxes that you could only see with red decoder glasses? 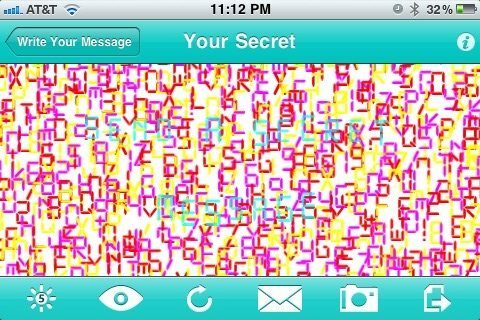 Now kids can create, send, and decode similar messages of their own with Hide n See, a free iPhone app! Hide n See lets your child make and send (or print, if you have a wireless printer) simple messages to Mom, Dad, or their friends. For children too young to have access to email or text messaging, it contains a “Pretend to Send” feature that lets them simulate sending their message and then have fun decoding it. Targeted at ages 7-11, the app has educational benefits as well. Its “red reveal” decoding process lets kids interactively experiment with color filters and mirrors, demonstrating principles from optics. You can even use the iPhone’s camera as a substitute for red decoder glasses!